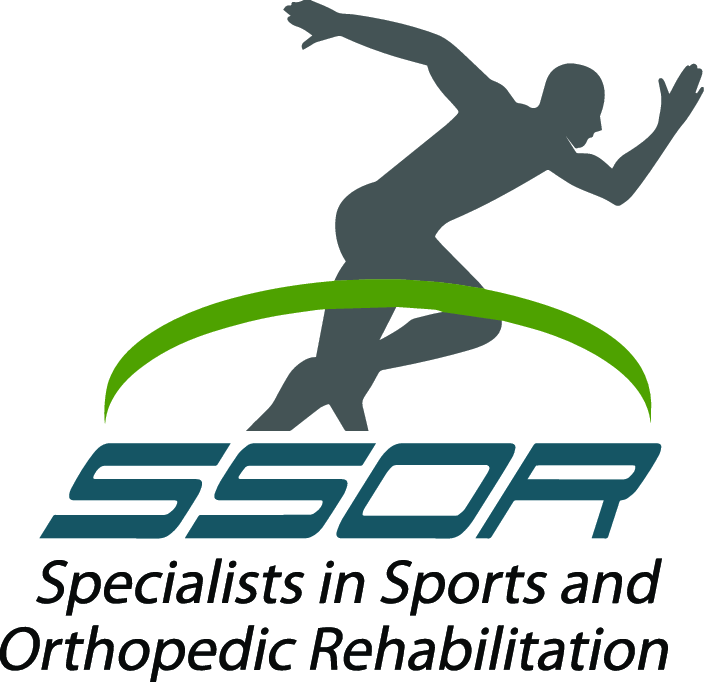 We have an active, results-oriented population here at SSOR. As a result, we see many patients who are battling “tendinopathies,” a catch-all term for pathology and pain in tendons. One of those regions we see a lot that affects people across the lifespan is Achilles tendinopathy. The general public commonly refers to it as “Achilles tendinitis.” Achilles tendinitis can be painful, debilitating, and significantly restrict your ability to perform activities of daily living as well as recreational activities. So what’s the deal with achilles tendinitis? Like most injuries, there are intrinsic causes that center around your body structure and there are extrinsic causes that center around training methodologies or training environments. Intrinsically, flat feet can stress the Achilles because it creates an angulation of the heel and alters the pull of the Achilles. 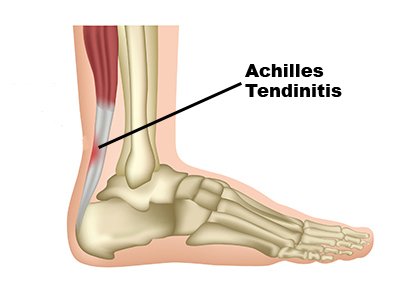 Previous injury can cause Achilles tendinitis from residual strength deficits. People that are excessively flexible or very tight can also be susceptible to Achilles tendinitis. These are just a few of the common intrinsic causes, but many more exist. Extrinsic causes basically center around training errors. The biggest one is doing too much too soon and not properly progressing exercise, like running or training for races. Another extrinsic cause is the training surface. Concrete is not very forgiving. You should run on school tracks, trails, or blacktop to ease the shock on the Achilles. Shoe wear can contribute. Therefore, make sure you purchase supportive, comfortable shoes, not because of the logo on the shoe. Finally, believe it or not, some powerful antibiotics have been implicated in Achilles tendinitis because they are believed to kill tenocytes, which are tendon cells. You should talk to your doctor if you’ve been ill recently and were on an antibiotic and then started having trouble after. There are several things you can do to treat Achilles tendinitis. Ensuring you have properly fitting shoes and if necessary, orthotics is a good start. A slight heel lift in your shoe can reduce strain on the Achilles as well and is a cost effective intervention. Basically, put this in the shoe of the involved leg and see if that helps when you do your activity. Stretching exercises for the calves is very important and you should stretch both your gastrocnemius and the soleus. Stretches should be held for 30 seconds. See figures 1 and 2 for these stretches. Recent evidence has supported the use of isometric exercises to help with tendon pain. This video specifically shows how to do this for the Achilles. Eccentric exercises have also been shown to be effective for Achilles tendinitis. That said, there is a very specific way they should be done and you should see a physical therapist or athletic trainer to learn how. 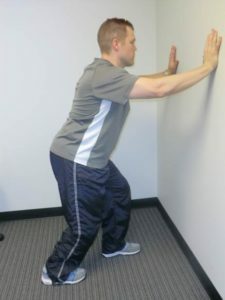 Here is a well-written blog on progressing these exercises. Finally, similar to any lower extremity injury, gluteal strengthening is imperative because strong glutes stabilize the pelvis and everything attaches to the pelvis. Those big muscles in your hips act as shock absorbers so that skinny Achilles doesn’t have to work so hard. It may not make a lot of sense, but gluteal strengthening should be an integral part of rehabilitation for Achilles tendinitis. 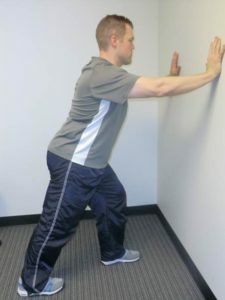 Figure 1: Gastrocnemius stretch. Keep your knee straight, heel on the ground, and bend the front knee towards the wall until you feel a stretch in the Achilles. Do not let your heel raise from the ground. Figure 2: Soleus Stretch. Bend the back knee, keeping the heel on the floor. We are experts in the treatment of tendinopathies. 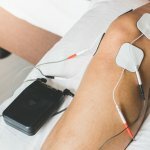 Our team of physical therapists understand how to evaluate these conditions and how to apply interventions that specifically target your pain and dysfunction. It would be a privilege to serve you and partner with you in your care. Give us a call! Remember, you can see a physical therapist in Kansas without a physician referral.